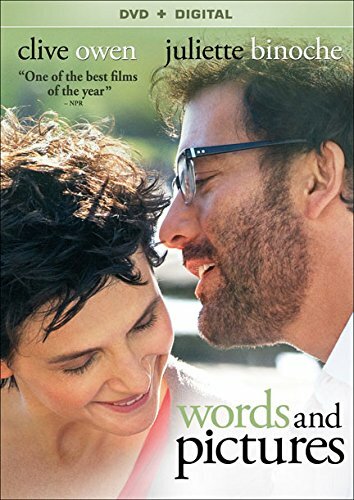 Words and Pictures, while perhaps not perfect, is a movie that is much better than its 6.6 user rating on IMDB would suggest, a rating earned probably because it’s not a Hollywoodish movie. It demands your close attention, and may not be for everyone. In fact, the appeal will no doubt be mostly to viewers who read a review such as this one. If you keep reading this article without losing interest, you will probably like the movie. The main characters in the story are a man (Jack Marcus, played by Clive Owen), once a successful writer, and a teacher of Honors English; and a woman (Dina Delsanto, played by Juliette Binoche), an even more successful painter and a teacher of Honors Art. He is a brilliant teacher who engages and inspires students. He drinks too much. He’s an alcoholic. 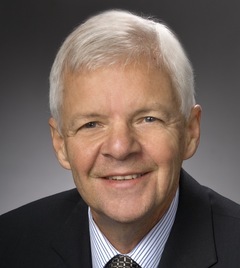 He has a son who appears in a minor but necessary role. There’s no mention of an ex or deceased wife or even an old girlfriend. The apparently gifted and becoming-successful son just exists, and the two are not close because of the father’s drinking. She is a fine teacher, too, but somewhat on the stern and detached side. She has rheumatoid arthritis, which has affected her ability to paint, and is obviously unhappy about having to resort to teaching because of it. When he shouts at his students, they get motivated. When she shouts at their students, they get discouraged. The setting is a prep school in Maine. It’s not a stereotypical Hollywood prep school. It’s the sort of prep school that actually teaches students who want to learn stuff. It’s the sort of prep school I would have wanted my kids to go to if I’d sent them to one. The script is scintillating and is the centerpiece of the movie. The Owen character and the Binoche character get into a spirited debate — edgy without being outright hostile — about the philosophical question of which has more value: words or pictures, a discussion that spreads school-wide. The dialogue is crisp, fast-paced, and thought provoking, like a discussion between Supreme Court justices. And thus the title, and also the reason it’s not a Hollywood style movie. In the course of it we get to hear a lot of good words and see a lot of good pictures (paintings). To me, Clive Owen’s character is the stronger and more interesting of the two. Yes, he has problems, but he’s got genuine passion for what he does, and he’s not really a horrible person. Owen is a terrific actor. His delivery and timing are impeccable, and he’s said to possess a phenomenal memory. The “Behind the Scenes” extra on the Blu-ray disc said he showed up the first day with a four-page monologue that occurs early in the film memorized cold; that he had to deliver it twenty-seven times to get various camera angles (his audience is a class of students); and that he delivered it with passion every time, never mechanically, and never dropped or fumbled a line. As such it was a performance and an acting lesson for the young actors playing students. Juliette Binoche’s character is not a grumpus for the sake of being a grumpus, just to provide counterpoint and contrast, but a woman who is trying her very best to make the best of her unavoidable circumstances, like Stephen Hawking with ALS. Viewers understand and root for her to succeed. What I did not know is that Ms. Binoche is herself a talented painter of long experience, and that she herself painted all the work shown in the film as being by her character. Part of her character’s development is to evolve her style from fairly average-size to small paintings with a certain amount of abstract semi-realism to finding new ways of painting … using large canvases, inventing new tools, brushes the size of mops, controlled by pulleys and cables, as she migrates into a new style of pure abstract painting. And you get to see a fair amount of Ms. Binoche actually working on it, in some cases gliding around on her stomach on chairs and dangling from slings and the like. There is, of course, a love-hate relationship between the two, and it’s inevitable that it would develop into a romance. How that works out in the end, and how Jack Marcus deals with his alcoholism I will leave to you to discover when you see it, but will caution that the romance is not the most important element of the movie. The constant play of words against pictures is. So the movie is well named. This entry was posted in Arts, Film, Re: Views. Bookmark the permalink.